Enjoying the great outdoors with friends, conducting long business meetings, listening to your favorite podcast or music – no matter how much activity and work you like to pack into your day, Signia’s longer-lasting Pure® Charge&Go keeps going with you. True to its name, Pure Charge&Go can be fully charged while you sleep so it’s always ready to go when you are. Signia’s Pure Charge&Go comes with an inductive charger. 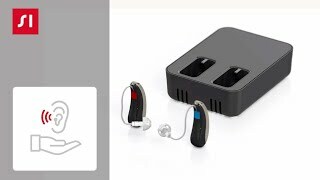 The hearing aids start charging automatically when you place them in the charger and turn on automatically when you take them out. Hidden behind your ear, Pure Charge&Go is a real high-tech marvel. It offers the most natural sound and highest hearing performance as well as superior connectivity in a sleek design. Pure Charge&Go tackles a wide range of hearing loss from mild to severe and gives you back the natural sound of life. Thanks to its rechargeable, high-capacity lithium-ion power cell, Signia’s Pure Charge&Go offers a long-lasting, superior hearing experience even when you’re streaming audio. From discussing art after visiting a museum to enjoying the excitement of a new city with your loved ones, our new hearing aids let you delight in the world of sound. They maintain the natural sound of your own voice and balance it with all surrounding sounds. This lets you enjoy the most natural listening experience and highest hearing performance, even when exploring exciting new destinations. Stream audio from a theater production straight into your ears, discreetly adjust the volume to suit your preferences while binge-watching a new series on TV, or hear the fastest route to the most famous sights from your navigation app. All you need is a smartphone. Through the myControl™ App, our new hearing aids offer you supreme connectivity for audio streaming from various sources and remote control – all at your fingertips. Stream phone calls directly from your Apple® smartphone* to your hearing aids for complete convenience. Listen to your favorite music streamed directly into your hearing aids from your Apple device* for an outstanding sound experience. 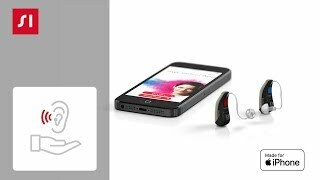 The myControl App lets you change your hearing aid settings remotely and personalize your hearing aids to suit your individual preferences. Many hearing aid wearers have difficulty getting used to the sound of their own voice, saying it sounds loud and unnatural. 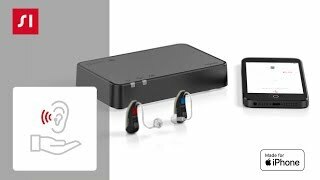 As a world’s first, our new hearing aids solve this: Own Voice Processing (OVP™) provides you with a natural sounding own voice combined with optimal perception of all other sounds for the most pleasant, natural listening experience. 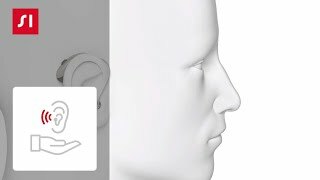 Thanks to their Speech Quality, our new hearing aids enable you to hear speech clearly in all situations through advanced noise suppression technologies. This makes it easier for you to understand your conversation partner, even in very noisy environments like restaurants or conventions. Sound Clarity offers the most natural, lifelike sound in every listening situation. This lets you enjoy crystal-clear sound, even in the loudest environments. The myControl™ App puts complete control of your new Signia hearing aids at your fingertips. Available for iOS® and Android™ phones, the app offers advanced remote control options so you can change settings and personalize your hearing aids according to your individual preferences. Available in different sizes, extremely soft silicone sleeves click easily onto your hearing aids. They sit securely in your ears for a completely natural, perfect fit immediately — no need to wait for a custom-made housing as with other in-the-ear hearing aids. How is the battery runtime of Pure Charge&Go? Can I use it with full charge the whole day long? Yes. With Pure Charge&Go, we offer a daily runtime of 19h without streaming and 17h with 5h direct streaming via Bluetooth. Considering the fact that an average daily usage of hearing aids is 16h, you can use Pure Charge&Go without any concern about battery life, even with direct audio streaming. Full-charging time of Pure Charge&Go is approximately 3 hours. Can I still use it if I do not have time for making a full charge? Yes. With the fast charging option provided by Pure Charge&Go, you can use the hearing aids 6 hours long with a 30 min charging.